Can storytelling carry a game? Quantic dreams the makers of Heavy Rain would say so and after playing their effort I would have to agree. The quick time events and basic movements give you an easy ride so that the main focus of your attention is the plot and character interactions. Admittedly this release was from when the game was first announced but the blurb on Amazon on its release is almost the same as this original quote. Most shooters to this point have promised much in terms of storytelling but most campaigns seem to be a training ground for the multiplayer so if Spec Ops could make this work it could make this a single player with replay value above the promise of trophies. The story is based in a sandstorm destroyed Dubai. With the force of nature laying waste to a purpose built modern city (we can already see the metaphor for the destruction of civilisation by that which cannot be controlled). You play as Delta operatives sent to investigate the lost 33rd Division of the American army. Your squad is comprised of three soldiers with you controlling the leader Capt Walker voiced by Nolan North. As this game is heavy on narrative having a strong cast for the vocal talent was important and in this way the producers defiantly delivered. The voices of all the characters seem to be well thought out and executed; I feel this helps you to feel immersed in the experience creating a better game. As for the rest of the sound it’s passable with music being used sparingly and mostly to add effect to the games set pieces. Graphics is where I start to have issues with this game, they are generally good for the main characters and the vistas of Dubai are at times excellent. It’s the multiple dead bodies that you run into as your walking around that take you of the experience. Judging from the audio at this point you are supposed to feeling sad for the loss of life but as the graphical representation of the dead is so bad it’s easy to just keep on walking without paying that much attention. 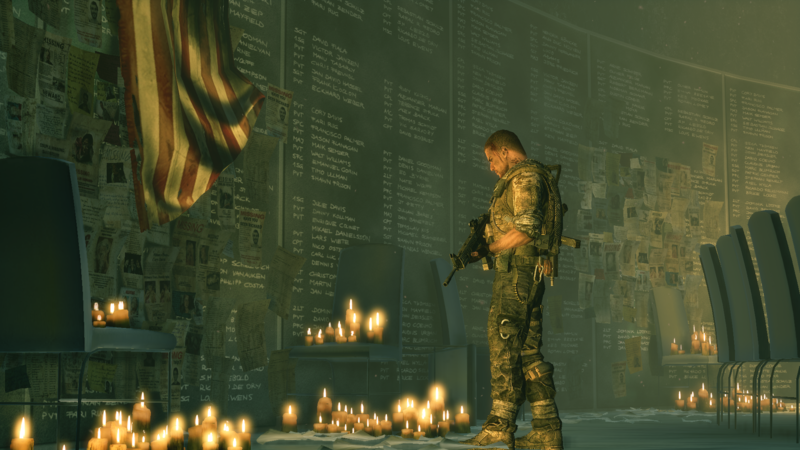 This is further emphasised by the use of cut scenes involving dead American soldiers where the graphical representation goes back to a more realistic level. Some consistency would make for a better experience, I feel instead of trying to go for quantity to achieve a sense of revulsion a higher level of animation on fewer dead bodies would make a greater impact. The actual mechanics of the game are solid. The guns handle well with a mix of sway and recoil that all seem to fit for their particular characteristics. Melee is used as a way to stun and not kill and I do like this in games as it adds to the strategy of taking an opponent out instead of just panic knifing your way through tough scrapes. The cover system has some nice touches, like if you’re running toward cover and hit X (for PS3) you activate a slide into that piece of cover, it works pretty well most of the time and you can reload during this animation as well. Ammo is not abundant but enemy weapons are so don’t be afraid to scavenge guns whenever possible. Now we come to my biggest gripe we were supposed to be able to use the very sand that laid waste to Dubai as an ally in our struggle. This is true when the game allows you to do it, but a couple of times when I could see a pane of glass which looked perfect to bury some of my foes I would try to shoot it out but to no avail. Then a few more enemies would arrive and I would be told to take the glass out at that point. This to me shows the hall marks of an on rail shooter not a proactive dynamic experience. For this to happen we need truly destructible environments with consequences for destruction not a point and shoot at a determined time. Sandstorms are another mechanic which does not seem fully utilised; they seem to be more of a way to move the story along instead of actually altering the entire mechanics of engagements. They look good but not up to par with Uncharted 3’s take on this phenomenon. The game has five difficulty levels with the medium level being a little more challenging than the usual difficulty at this standard. I appreciate difficulty and my deaths did not feel too cheap. Dying causes a problem where you get placed back into a rather tedious loading screen. It also allows you to read little quotes about the game from gameplay tips to questions which try to challenge your morality. My favourite of which is “to kill for yourself is murder, to kill for the government is heroic, to kill for entertainment is harmless”. This type of question does not really challenge me; it just makes me think that it’s a clever person trying to question my moral code. This game is a form of storytelling not a moral passage, if they give you the option to use nonlethal force or stealth to avoid enemies in every area of the game instead of lighting them up I can understand moral gnashing of teeth when I choose to create killing fields. The game fails to deliver that necessary morality in the choices you make and so just becomes another military shooter with a rather nice backdrop. Having said that your choices do allow for multiple endings but after watching the alternates on Youtube they did not add that much to the narrative of the game. The Multiplayer is generally well thought out from interesting maps with limited destructibility to customizable classes. It’s not hidden behind a pay barrier so you can play it if you rent the game. I did enjoy my limited time running around Dubai but it did not grab me with any interesting gameplay mechanics above the occasional sandstorm. If you had to pay for I would say not to worry but as it’s free knock yourself out. This review was rather harsh at certain points but I did have high hopes for this game to actually do something special in a genre that has become a little stale. The game is very solid and I would recommend it for rental but I do not feel it has the depth to really challenge views and make it a purchase. My hope is that developers look at this as blueprint for the way to go forward in story development within games. It’s just this opening salvo needed a bit more work to reach the level it set itself.